Luke Frost’s work can be seen as following in the tradition of the 1960s American ‘colourfield’ abstract painters such as Gene Davis, Jack Bush, Morris Louis and Kenneth Noland. He acknowledges the influence of other American artists such as Donald Judd and Dan Flavin and a notable British contemporary, Ian Davenport. 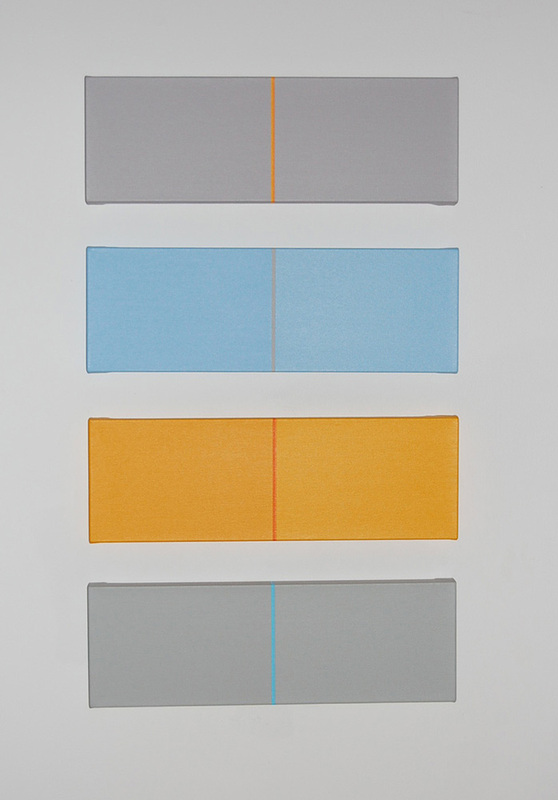 This group of four canvases typifies the strict formality of Frost’s work in which areas of colour are interrupted by vertical stripes of contrasting or resonating colour – which he refers to as ‘volts’. These visually interact with the smooth, painstakingly built up background hues, drawing attention to subtle modulations and contrasts and enriching the viewer’s perception and experience of colour.